Tiaras & Prozac: Where do you hide yours? So you barely survive the actual shopping part of Christmas presents with some remnants of sanity still intact using tactics such as a present for them, a Gin for me etc then you realise, it's not actually Christmas yet, where the hell are you supposed to store all this ...stuff. If you're lucky you'll have nooks and crannies galore, if however you're like us, you'll be storage challenged. I don't even have a wardrobe, my clothing being crammed into broken drawers, lolling out of them like a dogs tongue on a summers day. We have no garage, porch, conservatory nor even a shed. Arse. What an inconsiderate house. The bloody cheek of it, does it not understand our need for storage? There's simply no room at the inn. I do however have a cupboard (with a broken door) in the main bedroom, which is crammed with paraphernalia of my youth, trinkets, out of season clothing, mountains of books and the like which at a push I can throw some presents in so long as I place the door back in front of it within seconds, or else it'll all fall out, whilst praying to The Gods. Taking a deep breath whispering the mantra 'on the rocks on the rocks on the rocks' (thinking of Gin obviously, though I suppose it's rather an apt description for my lacking sanity too) I then execute with ninja finesse, the bum swap, that is to say swapping my gluteus maximus for the rocking chair of doom, to hold the door in place. And breathe. Jobs a good 'un now for the remaining mountain of presents. Bumflaps. Had momentarily forgot about those in some mental defense coping mechanism. There is the cupboard in the kitchen, which is full of junk and is where the coats are kept so it's patently obvious if we stash anything there. Besides, the chance would be a fine thing, it takes sheer skill to venture in there without instigating a landslide of junk. Call it what you may be it complete and utter laziness or a stroke of sheer genius but i'll let you into a secret, some of the presents.....we don't hide at all. Yes, really. At the bottom of our stairs and next to the front door is a heavily populated yet compact landscape of delivery boxes, in plain site. the thing is, if you hide things people will look for them, if they're not hidden then they mustn't be terribly interesting or else why would they be so obviously unhidden? We haven't even opened the boxes yet which adds to the ruse that they're unimportant. Everybody knows that the first thing you do when an exciting box of something arrives is to open it. Have The Spawn touched the boxes? No. Have they asked about them? No. Are they even slightly interested in them other than the fact they're in the way? No. This is the response of The Spawn, three highly skilled, frightfully curious professional sanity assassins. It's nigh surreal. The other option, is to hide them quite literally under their noses. 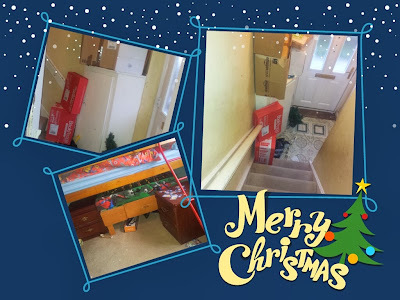 Last year we hid several large presents under Thing One's mid sleeper bed, the fact he never found them is testament to the absolute tip he leaves his room in. He slept on top of them for weeks, absolutely oblivious. Oh and lets not mention the stuff we stash in the boiler cupboard, again in Thing One's room. So where do you hide yours? Have your kids ever found them? Do you wrap when you buy or wrap en masse nearer Christmas eve? “This post is an entry into the Hudl Christmas cheer competition. I have hidden gifts in suitcases, under the bed covered in trash bags, behind the couch, in the top of the closet, in my dresser drawers. Good luck hiding them so that the kids can't find their gifts. If possible wrap them before hiding them so if they do find them, they can't see what they are getting. So far so good, they've not even tried to peek in the boxes!